IT WAS all pretty symbolic. Jack Riewoldt flying for the mark, overrunning the flight of the footy, but having Tom Lynch standing in pole position behind him to kick the first goal of the year. Just minutes into Thursday night’s season opener, this was a glimpse of the new-look Tigers. Much of the summer had been spent debating how Lynch’s arrival would change the way Richmond attacked. The rest was seemingly spent debating whether he would even play. Both questions were answered rather emphatically over the space of 36 hours. Yes, Lynch did play. And no, not much had changed for a potent Richmond outfit. 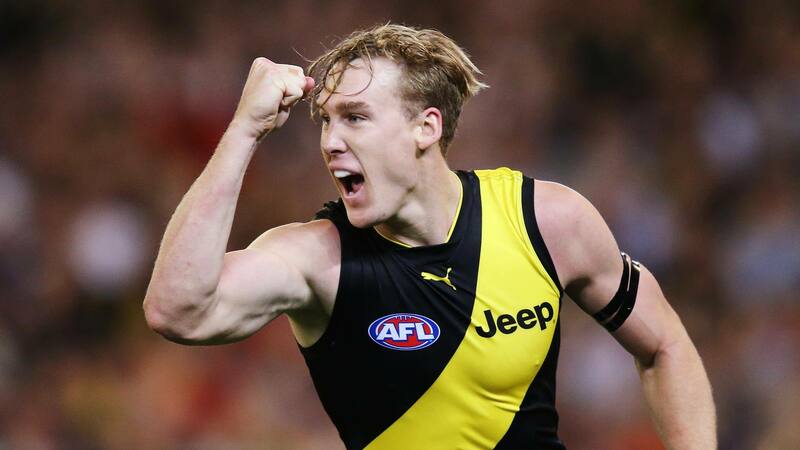 While the arrival of the former Gold Coast captain meant a two-pronged tall forward line with Riewoldt, the Tigers still did their damage from manic, aggressive pressure. Lynch’s second, kicked moments later and part of an unanswered six-goal run to start the game, was the result of a forced Carlton turnover and a quick handball out the back. It turns out playing two talls wouldn’t suddenly make the 2017 premiers immobile. Maybe playing three wouldn’t, either. Athletic 194cm debutant Noah Balta soon joined Lynch as a first-kick, first-goal Tiger and a rampant Richmond looked to put the game to bed before quarter time. It was all very similar to the Richmond side the Tiger faithful knew and loved. Until it wasn’t. Gradually, a 40-point lead was whittled away. Soon, it became just a 12-point margin. Where Lynch and Riewoldt looked dangerous early, they became rather ineffectual late. Lynch was spending more and more time on the bench, with his return to footy from a long-term knee injury sustained at the Suns being managed cautiously by the Tiger medics. For Riewoldt, it simply wasn’t his night at the office. Fantastic field positions were spurned by hacked kicks that flew off the side of his boot. Much like his partnership with Lynch, his night was scratchy to say the least. “(Jack’s game) typified how those forwards worked,” Damien Hardwick said after the match. However, despite the hiccups along the way during Thursday night’s game, this was the benefit Richmond envisaged by having a dual threat. While one had a forgettable evening, the other was on hand to boot three crucial goals in the context of the game. “Tom kicked three, but he got his hands to a lot,” Hardwick added. “He hasn’t played footy for six, seven, eight months. He was always going to be rusty and we accepted that as a coaching group. We were just happy he got through the game. As the match progressed, with Richmond dominating throughout the game’s infancy, it wasn’t hard to slowly get drawn more and more to the pair’s work in tandem. Riewoldt, manned by Liam Jones, began many of the restarts out of the goal square thanks to the new 6-6-6 rules. Lynch, paired with Jacob Weitering, was higher up the field. Both carried the water for Dustin Martin when the superstar shifted from the centre. But while they both led strongly and brought the ball to ground for their speedy smaller teammates, it was how they profited from the pressure around them that was encouraging. With every turnover forced by Richmond’s remarkable intensity at the ball all around the ground – not just forward – the duo were on their bike, running hard back to goal to ensure a price was paid. If they weren’t the ones to capitalise, they drew defenders away from the ball carrier with their work ethic. That, in turn, meant one of their teammates surely exploited the effort. Eventually, Lynch did – again. Just when Carlton looked most threatening early in the final term, the club’s star new recruit cleaned up a typically scrappy Richmond foray forward. His rushed kick was a goal, his third of the match, and the contest was effectively won. First game, first big tick for the Tigers.